Wal-Mart had a bag of tropical mix for a $1. I still had a half bag of chocolate chips. It was time to make cookies! These cookies are made up of ingredients I go from my mother-in-law. She had a stroke a while back and can no longer cook. One of the items I used for the first time is self rising flour. I was not anticipating the texture of the cookies. 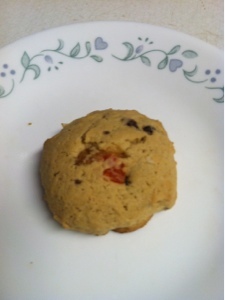 It lacked the chewiness I was use too and it had a more of a biscuit or cake like texture. It was not bad. I will just not use self rising flour again in cookies. Mix the butter, shortening, eggs, and milk. Stir in the flour, baking soda, and salt. Add the tropical mix and the chocolate chips. Drop round teaspoonful's onto a greased cookie sheet, bake 8-10 minutes.